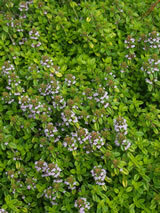 Aromatic culinary herb which forms a dense low mat of strongly lemon scented foliage. New growth is a bright yellow-green. Masses of pale lilac flowers in summer. Prefers a warm and sunny site, with well drained soil. Important plant to bees. 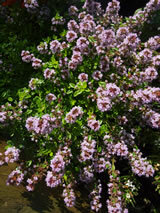 Contains the essential oil thymol, with many useful properties. Will tolerate light foot traffic.